There was nothing in writing at that time—more particularly, nothing in Judge David M. Rothman’s California Judicial Conduct Handbook that supported the position of an exception. Judge Rothman’s book is, of course, the gold standard of judicial ethics books. As comprehensive as it is, it does not detail the distinctions in the role of the Juvenile Court judge. 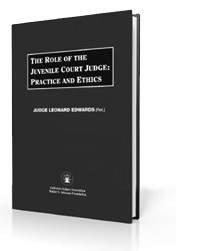 Judge Edwards’ new book explains the unique role of the Juvenile Court judge in the context of discussions of ethics. The book takes a very different approach, in structure and content, from California Judicial Conduct Handbook. 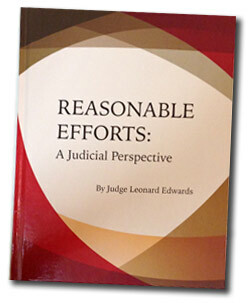 Judge Edwards’ book uses hypothetical scenarios that Juvenile Court judges may encounter in their work on the bench, identifies practice and ethical issues, and proposes approaches, offering advice and solutions to the judicial officer. The focus is on practical, ethical issues that the Juvenile Court judicial officer encounters. The book is well indexed and organized. It is divided into three parts: Running the Juvenile Court, Ex Parte Communications, and Working Off the Bench. Each has approximately 30 sections with several scenarios. The Table of Contents can be used to find an exact discussion of an issue facing a Juvenile Court judge. This is a book for specialists—Juvenile Court judges. It should be kept in easy reach of each of us in chambers, right next to the California Judicial Conduct Handbook. Vida Castaneda is a Senior Analyst in the Tribal/State Programs Unit with the Center for Families, Children & the Courts and has been employed by the Judicial Council of California since December 2005. She is multi-ethnic and descendant of the Chumash, Ohlone, Tarahumara and Zapotec tribes. Editorial by Leonard Edwards, special to the San Jose Mercury News on December 23, 2018. Child Trends, the nation’s leading nonprofit research organization focused exclusively on improving the lives and prospects of children, youth, and their families, has published a study on Los Angeles County’s Upfront Family Finding Pilot program. The pilot has resulted in remarkable results for relative placement. Legal determinations and judicial obligations for relative placement and family finding are required for all children in or entering foster care in both child welfare and juvenile justice proceedings. On November 28, 2017, the Chief Justice of California, Tani Cantil-Sakauye was the featured speaker in the 2017 Don Edwards Lecture at San Jose State University. She was introduced by SJSU President Mary Papazian and Santa Clara County Supervisor Cindy Chavez. The conversation was moderated by retired Santa Clara County Superior Court judge Len Edwards. Editorial by Leonard Edwards and Susan Eilenberg, who is a trustee of the San Jose Unified School District and member of the Santa Clara County Commission on the Status of Women. They wrote this for the San Jose Mercury News, February 3, 2017. Thanks to Judge Len Edwards and Susan Ellenberg for highlighting the need “to help kids whose moms are in jail” (Opinion, Feb. 3). Studies show parental incarceration has a profound impact on children due to the trauma of separation, the secrecy that often surrounds it, the stigma the child feels, and the financial hardships that can result in lifelong poverty. There is also data to show that a father’s incarceration has a particularly negative influence on boys who are more likely to have increased juvenile delinquency and are less likely to complete college. We need to implement Edwards’ and Ellenberg’s recommended steps to decrease incarceration of mothers. We also need to design a support system for families affected by incarceration that includes programs to encourage parentchild connection, social-emotional support for children, and financial supports that relieve the chronic stress of having a missing wage-earner. Editorial by Leonard Edwards and Balaji Govindaswami, special to the San Jose Mercury News on August 12, 2016. Why Should Indian Children be Treated Differently? The NACC Guardian, Vol 38 · No 06 (August 2016), a publication of the National Association of Counsel for Children. Attacks on implementation of the Indian Child Welfare Act (ICWA) have recently been in the headlines. Several critics of the ICWA have stated that Indian Children should not be treated differently in child welfare and adoption proceedings. Despite these attacks, there are compelling reasons why the ICWA should be fully implemented. This article outlines some of the reasons for full implementation and argues that there are important reasons why Native American children should receive special treatment in the courts. Los Altos Hills resident Judge Leonard Edwards, pictured with Child Advocates of Silicon Valley Executive Director Karen Scussel, was among six CASA Heroes and Legends recognized May 21 at the organization’s 30th anniversary gala. The California Tribal Court–State Court Forum has issued its September 2015 E-Update. J. Robert Lowenbach, a retired Colorado district judge and currently a consultant on child trauma and court improvement, cites Reasonable Efforts: A Judicial Perspective in the National Association of Counsel for Children (NACC)’s The Guardian (Oct./Nov. 2014, reprinted by permission) as a resource for child advocates. This is a recent article on the London Family Drug and Alcohol Court (FDAC), which has been pioneering a new approach to child protection cases in which one or both parents have drug or alcohol problems. These updated guidelines provide guidance to State courts and child welfare agencies implementing the Indian Child Welfare Act’s (ICWA) provisions in light of written and oral comments received during a review of the Bureau of Indian Affairs (BIA) Guidelines for State Courts in Indian Child Custody Proceedings published in 1979. They also reflect recommendations made by the Attorney General’s Advisory Committee on American Indian/Alaska Native Children Exposed to Violence and significant developments in jurisprudence since ICWA’s inception. Family Drug and Alcohol Court, initiated in England in 2008, has been extended throughout England and Wales. The Feb. 18, 2015 news article posted on the UK Family Law Week site is available here. Reasonable Efforts: A Judicial Perspective is noted as a resource on the Intensive Family Preservation Services (IFPS) blog. IFPS provides intensive, in-home crisis intervention, counseling, and life-skills education for families who have children at imminent risk of placement in state-funded care. The Associated Press has published results of its six-year, multi-state study of child fatalities while in protective services—a disturbing report for juvenile court judges. The ACEs Too High website grows out of research by Centers for Disease Control and Kaiser Permanente showing that “Adverse Childhood Experiences” (abuse, neglect, parental divorce, etc) correlates closely with chronic illness in adulthood, including autoimmune disorders, heart disease, some types of cancer, COPD, as well as depression and other mental health conditions. The ACE study is described on the CDC’s website. A video trailer can be seen on the ACEs Too High Resources page. The Hon. Janice M. Rosa (ret.) reviews Judge Edwards’ book The Role of the Juvenile Court Judge: Practice and Ethics. Judge Edwards was the principal participant on the US side when the Dui Hua Foundation held its fourth US-China juvenile justice exchange with the Supreme People’s Court (SPC) in Beijing on October 13–14, 2014. Records sealing was the focus of the exchange. The Judges’ Page Newsletter of the National CASA Association has just published about 20 articles on Family Drug Treatment Courts. I organized the articles, worked with the authors, and contributed two articles of my own. This short video describes the Mentor Parent Program, a unique service provided by the Dependency Advocacy Center in Santa Clara County in its representation of parents in juvenile dependency cases.